Will Honey Make You Lose Belly Fat? No food, honey included, will cause your belly fat to just melt away. Getting rid of body fat requires you to lose weight, meaning you'll need to eat fewer calories than you use throughout the day to create a caloric deficit. Even then, not all the weight you lose will come from fat and not all of the fat will come from your belly. 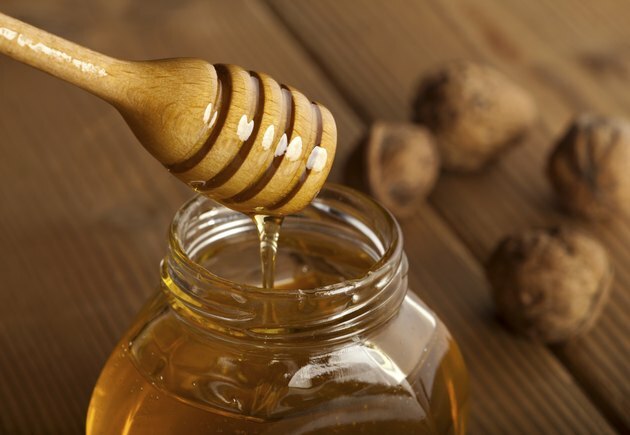 Honey can fit into a weight-loss diet, but it's no miracle weight-loss cure. Preliminary research using rats shows that replacing sugar with honey may have some beneficial effects for reducing belly fat. A study published in "Letters in Drug Design & Discovery" in January 2011 found that although the rats given honey and fat or sugar in addition to their food both gained more fat and weight than those given just the standard chow, the fat cells were smaller in the honey and fat group than in the sugar group. Another study, published in the "Journal of Food Science" in 2008, found that rats given a diet containing honey and those given a sugar-free diet had similar body fat and weight-gain levels, both of which were lower than in rats fed food with sugar. More research is needed to verify whether this is the case in people as well as rats. Honey has 64 calories per tablespoon, so it may be more likely to cause you to gain belly fat rather than lose it if you don't compensate for these calories. Maple syrup is similar in calories, with 52 per tablespoon. Table sugar has just 45 per tablespoon, but it's not as sweet as honey, so you might end up using more. Does Honey Lower Blood Pressure?